Upcoming 5G networks are a temporary fix but not a long-term solution. For that, researchers have focused on terahertz frequencies, the submillimeter wavelengths of the electromagnetic spectrum. 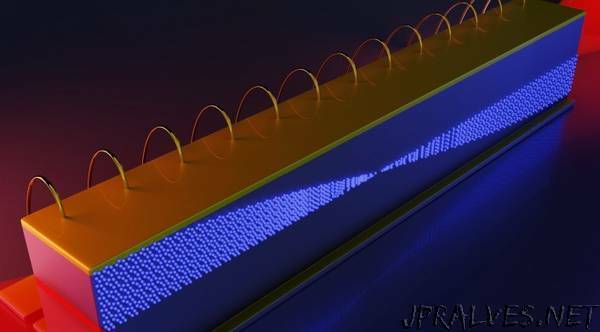 Data traveling at terahertz frequencies could move hundreds of times faster than today’s wireless. This work represents a complete paradigm shift for the way a laser can be operated. Frequency combs are widely-used, high-precision tools for measuring and detecting different frequencies — a.k.a. colors — of light. Unlike conventional lasers, which emit a single frequency, these lasers emit multiple frequencies simultaneously, evenly spaced to resemble the teeth of a comb. Today, optical frequency combs are used for everything from measuring the fingerprints of specific molecules to detecting distant exoplanets. This research, however, wasn’t interested in the optical output of the laser. Inside the laser, the different frequencies of light beat together to generate microwave radiation. The researchers discovered that light inside the cavity of the laser causes electrons to oscillate at microwave frequencies — which are within the communications spectrum. These oscillations can be externally modulated to encode information onto a carrier signal.